It’s my long teaching day, but can I just say that I’m actually looking forward to reading and hearing about people’s fear of Hillary Clinton over the next 9 years or so? At least, I hope she’ll be fearsome to many for at least 9 more years. ← Insert buzzword-filled garbage headline here. 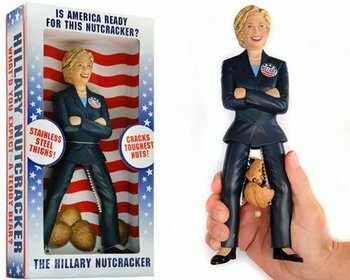 I’d forgotten about the Hillary nutcracker! This piece gives me a lot to think about, even as I’ve been mulling over all the media attention to Paul Ryan’s demand that his Speaker duties not interfere with family time. Hilary Clinton, for all her faults (and I think she has many), truly epitomizes everything that’s wrong with the persistent gender-power issues: Token women are fine, but don’t put them in charge. If you *do* put them in charge, make sure that they’re only mouthing the party line. If they don’t, then reach into your bag of tricks from the suffragette days: they’re ugly. They’re domineering. They’re emasculating. They’re old. Ignore the fact that congress and the presidency have always been full of ugly, domineering, old men. Here’s what I love about Hilary: She refuses to go away. Even her quietest presence seems to shout, “I’m still HERE, motherfuckers!” In this political climate, that is an accomplishment. I doubt that she’ll be able to crush that many of them. Some fair number of them will just implode before she even gets a cabinet assembled, or will slither off to the law firm senior counsel or policy tank posts that they probably crave more anyway. And the nature of gridlocked government creates something like a crush-proof box across the branches. It will crush all of them, and a lot more out there in t.v. land, however, just to contemplate another half-generation of being locked out of the things that only controlling the executive branch can provide. (generations being very short in national politics). And there will quite likely be some peripheral proxy-crushing of actors on the global stage who now benefit from Obama’s penchant for zen-diplomacy and “pivot” theatrics. But that’s only a guess. Notorious PhD hits it exactly for me. I have many qualms about Hilary, but I deeply admire her toughness. When I started my stint as department chair a few years ago I really wanted to get a Hilary nutcracker to display for the benefit of certain of my male colleagues. Then I decided that they’d probably charge me with harassment if I did — these of course being the kinds of men who deride all complaints from women as hysterical female snivelling.